PRINCETON, NJ – July 10, 2014 – Offering fans an addictive new way to connect with friends through the music they love, music technology startup MuseAmi today announced the release of its newest app, Hook’d, available exclusively for iPhone and iPod touch. Hook’d invites users to record short video performances of today’s hit songs and classic favorites, then share them with a friend or the world. Using master recordings and cutting-edge audio effects, anyone can sound his or her best as they “drop Hooks” to express moments most vividly conveyed through song. MuseAmi offers a diverse and growing repertoire of authentic backing tracks, starting with a selection of music licensed from Warner Music Group, and will announce additional licensing deals in the coming weeks. Hook’d employs MuseAmi’s proprietary technologies, including real-time audio processing, enabling users to create, view and share content quickly and easily from their iPhone or iPod touch. With real backing tracks and the same voice enhancement technology used in studio recordings, such as pitch correction and reverb, Hook’d offers the most compelling way for fans to engage with their favorite artists. For more information and the latest news from Hook’d and MuseAmi, visit www.getmehookd.com. You can download the media kit here. 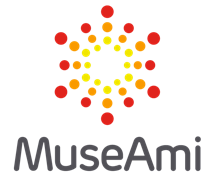 MuseAmi is a growing, privately held music technology company based in Princeton, N.J. The company was founded in 2007 by renowned concert pianist Robert Taub to enhance the ways individuals create, collaborate, learn and share music. With a team of industry leaders in the fields of music, machine learning and audio signal processing, MuseAmi creates highly efficient software to detect, analyze, and categorize visual and audio inputs in real world contexts. The company has developed significant intellectual property and has been awarded several patents that the company commercializes with its world-leading strategic partners. MuseAmi’s commercially available apps include ImproVox, a “vocal instrument” app, and the newly released Hook’d app.